They haven't even experienced the joys of maggothood! Despite what may appear to us a terrible missed opportunity, Jumping Bristletails stubbornly cling to their archaic way of life. There are about 350 species of them altogether, which is more or less nothing at all compared to some of the veteran fliers out there. Hundreds of thousands of beetles and tens of thousands of moths scoff at such paltry numbers. These are the tape traders of the insect world. They reject technological advance and live as a kind of primitive elite. Maybe I should say that tape trading is when two people swap music by first recording it on blank cassette tapes. It was quite common back when unpopular music was difficult to find. Some people, known scientifically as Diehard maniacs or Nostalgic old people continue this ancient practise into the modern era. Despite their small numbers, Jumping Bristletails are still found all over the world. Because of their thin exoskeleton they prefer cool, damp habitats where there's little danger of dehydration. That doesn't stop some of them from eking out a living in nooks and crannies in the Arctic or in deserts. All they need is a bit of soil, leaf litter or lichen and they're all set. One tremendous help must be their vesicles, which are little sac things they can push out of their abdomen to absorb water. Springtails do something similar. Meanwhile a loose covering of scales helps them escape the jaws of predators. That must work well with the Jumping thing. By tucking in their legs and slapping their flexible abdomen against the floor, Jumping Bristletails can hurl themselves several inches into the air. Some say they can leap up to a foot off the ground! Not bad for something scarcely half an inch long, but it's about as close to flying as they ever get. 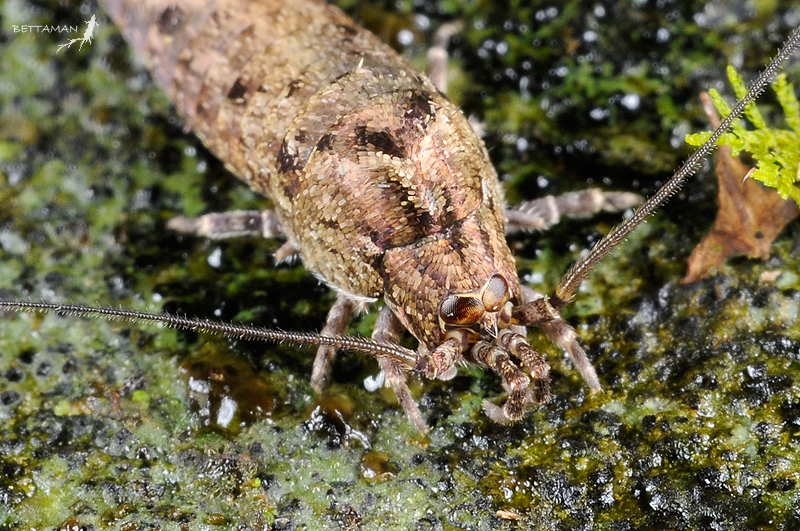 Jumping Bristletails look similar to another group of flightless insects, the Silverfish. Both of them are primitively wingless, which means they never evolved wings in the first place. That's unlike insects such as fleas which are wingless, but evolved from something that had wings. Ungrateful so-and-sos. There are several differences between Jumping Bristletails and Silverfish, aside from the fact that Silverfish don't jump. For one, Jumping Bristletails have enormous eyes! Or a tiny head. It depends on how you look at it. 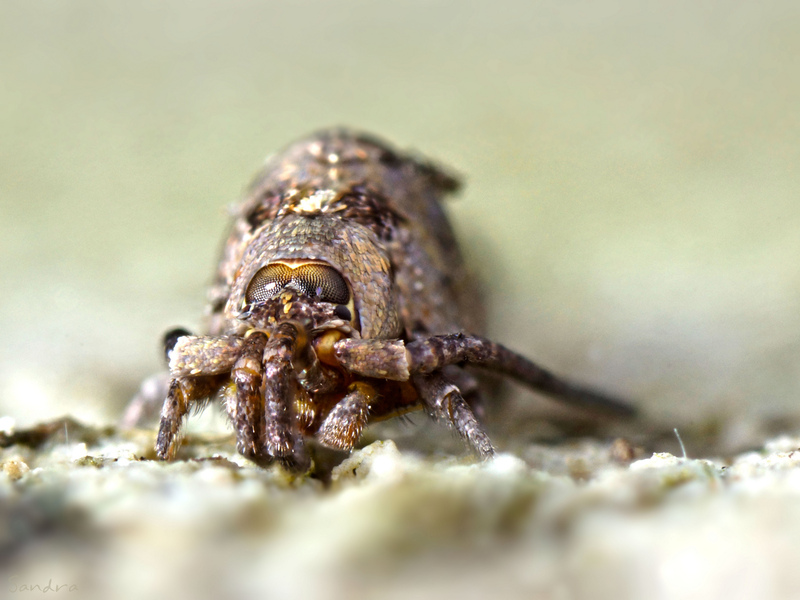 Certainly their eyes are big enough to meet at the top of their tiny head, which isn't the case with Silverfish. Jumping Bristletails also have a notable hunchback at their thorax and their three-pronged tail is different. For Silverfish, each prong is about the same length. 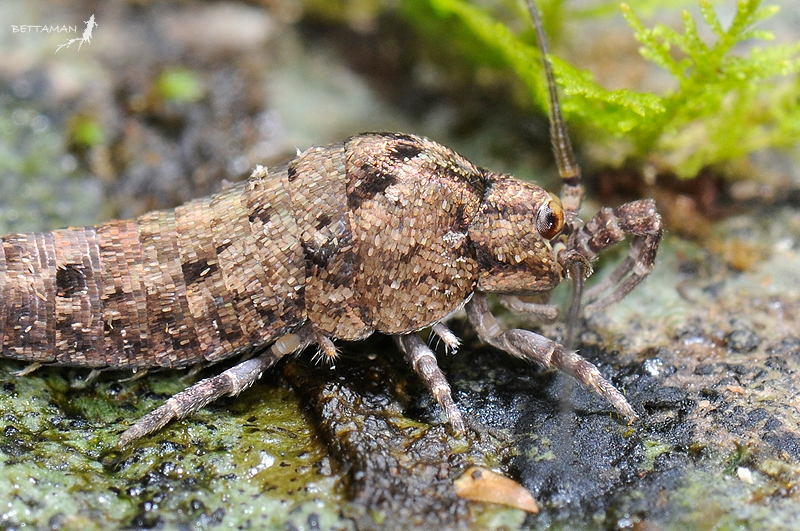 In Jumping Bristletails, the central prong is a lot longer than the other two. But there's another difference. 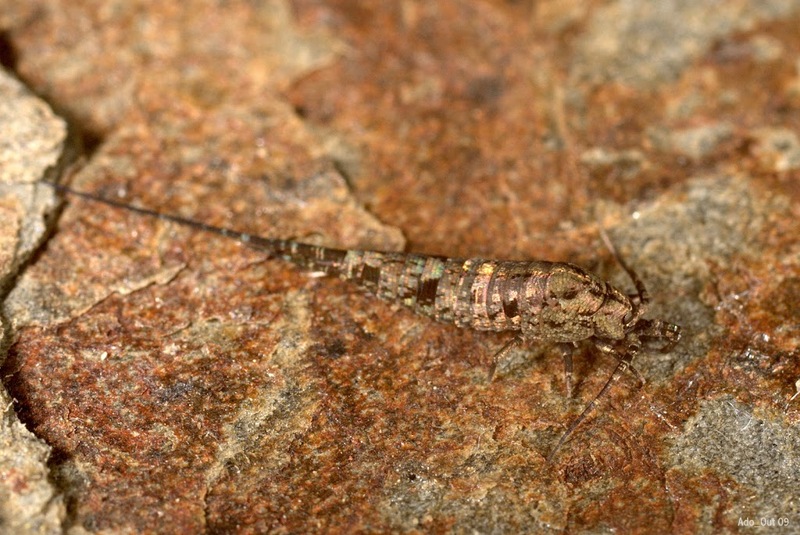 One that marks out the Jumping Bristletail as the true, primitive elite. You're not going to believe this but... they have just one condyle in their mandibles! A condyle is the "ball" in that famous double-act we know as the ball and socket joint. All other insects, including Silverfish, have two of these joints on each mandible to join with the rest of the head. 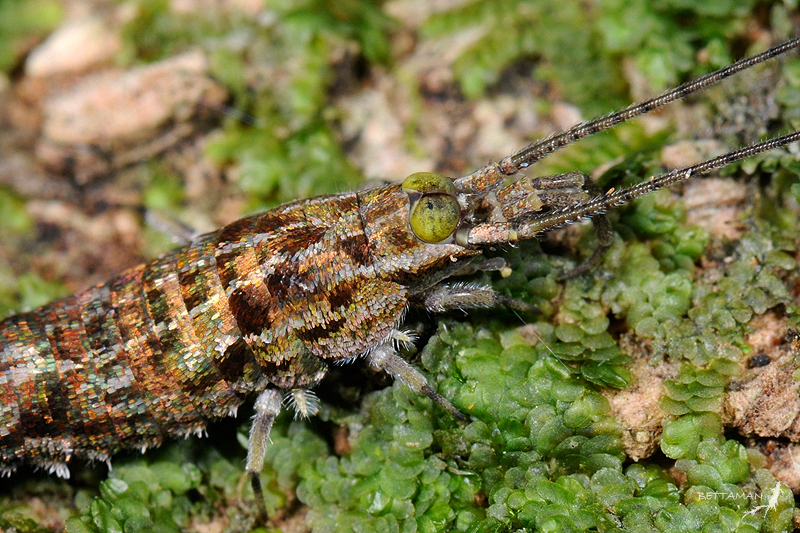 Jumping Bristletails are the only living insects with just one on each mandible. With this single condyle Jumping Bristletails have more flexible mandibles than other insects, after all having a pair of them completely defeats the point of a ball and socket! But it looks like it also makes their mouthparts much weaker since they can only eat soft algae and decaying material. It also supplies a name for their order: Archaeognatha, or "ancient jaw". Another strange characteristic unique to Jumping Bristletails is their styli, an assortment of tiny, manoeuvrable appendages on the underside of their abdomen. It's thought they may be vestigial legs! Even their reproduction is old-fashioned. They go a-courting and the lady's father always joins them to make sure they don't hold hands for too long. OK, no. What actually happens is that the male drops a little bag of sperm on the ground for the female to pick up. 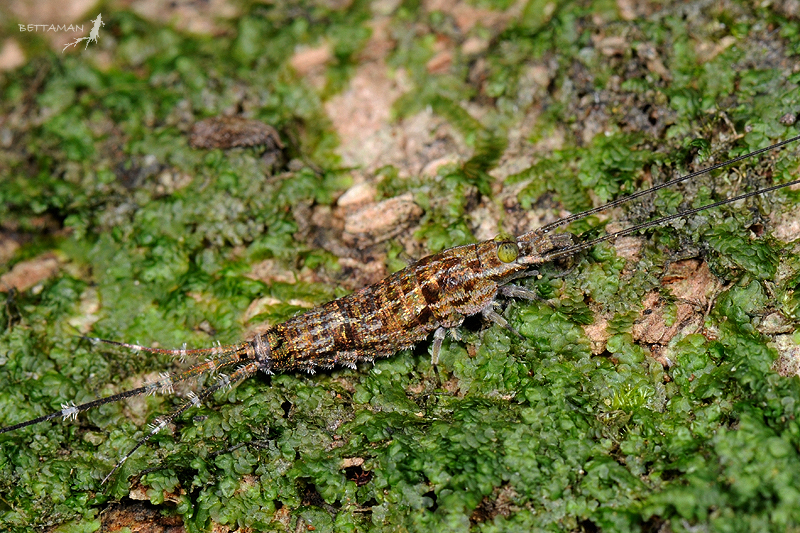 Silverfish do the same, but other insects have to actually copulate. Bits have to meet bobs and some insects will actually fly around while they're joined together. SHOCKING. But that's the "let it all hang out" generation for you. Baby Jumping Bristletails look just like tiny adults, something they again share with Silverfish. There are no larvae, no maggots or grubs or caterpillars. It takes them about 2 years to become an adult and then... they keep on growing! 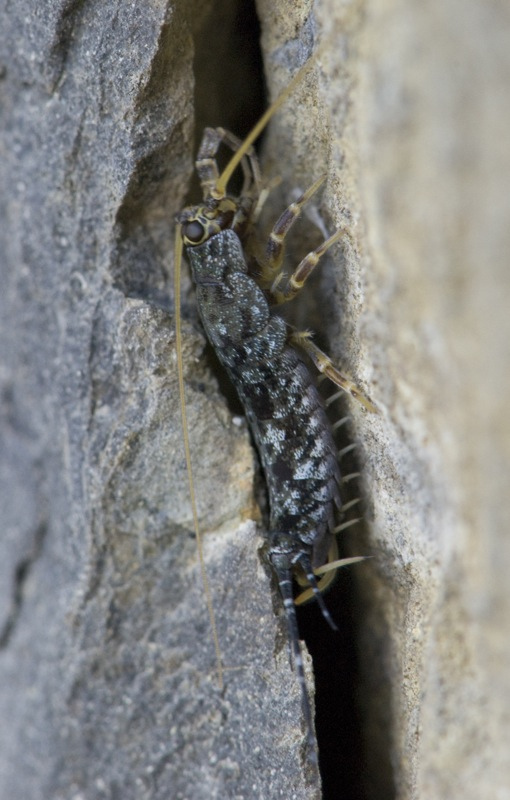 Jumping Bristletails and Silverfish are the only insects who keep growing once they reach adulthood. Also faeces. There's a lot of faeces involved in life. It's all over the place. We're pretty good at ignoring the fact that everyone around us has intimate experience with faeces, which is good because the stuff undercuts absolutely everything. Stories that involve utopias of the future must always thrust their faeces firmly under the carpet. Jumping Bristletails are, in their ancient wisdom, quite different. They actually use the stuff. Every time they need to climb out of their old exoskeleton and wait for their new, larger one to harden, they must first use their own faecal material to cement themselves to the ground. For them, sticky faeces is part of what marks the end of one stage of their life and the beginning of the next. We can learn a lot from that. I don't know if we'd learn anything good, but we'd learn something. tape traders - ha ha! Those eyes are ginormous. No really. They're freaking me out. Love the nose finger things! @TexWisGirl: Maybe we should all tape trade for a long and healthy life? @Esther: They're huge! And so shiny! @Lear's Fool: Those are so weird! I think all insects have them but they're not usually the same size as their legs! Wow! These things are waaaay grosser than I ever knew! Thanks, Real Monstrosities!